A female game developer who worked on Dragon's Dogma claims she was bullied to the point of becoming suicidal. 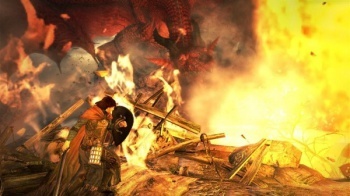 According to Kotaku's translation of an article on Minpokyo, the unnamed twenty-something female joined Capcom in 2009 and was assigned to what was the company's largest development team at the time, the Dragon's Dogma crew. Shortly after, a senior female employee was assigned to the team, and she promptly set about making things as unpleasant as possible for her younger subordinate. The new manager apparently singled out the young woman for criticism in meetings and frequently assigned her impossible tasks with no instructions. The young employee apparently spent months working on a database to increase the efficiency of internal game development, only to be dropped from the team and told "even if the database is a success, [she was] worthless to the team." Following that, two different superiors began trying to get her fired, apparently spreading rumors that "her ideas stink," that she was "problematic," prone to abandoning her work and skipping meetings. She approached Capcom's HR department, which did nothing about the bullying. Later the same year, the young woman was diagnosed with an anxiety disorder. During her sick leave, she attempted to commit suicide via an overdose of sleeping pills, antidepressants and cold medicine. When she eventually returned to work, other employees insisted she hadn't recovered. Her boss eventually suspended, then fired her. The young lady has since brought a lawsuit against Capcom. An appalling story, but right now we only have the young lady's side of the story, and fired employees are prone to making unpleasant claims about the companies that have fired them. That being said, Japan does have a sizable bullying problem, both in the schoolyard and the boardroom. Reports of "pawahara" or "power harassment," where managers use their authority to harass their subordinates, have been growing year over year. Back in January of this year, the Ministry of Health, Labor and Welfare released a definition of the term "power harassment." Unacceptable behavior included: "asking junior employees to perform impossible tasks, committing acts of violence and other physical offenses, causing emotional stress, isolating or ignoring individuals, asking personal questions, and giving an employee nothing or very little to do."